I've been listening to the new record from Isobel Campbell & Mark Lanegan. I've always loved Isobels sweet lush and gentle voice from her days as a chanteuse in Belle & Sebastian. 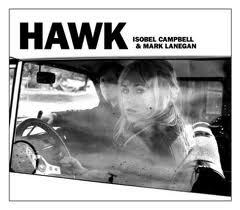 I reviewed the first record her and Lanegan put out in 2006 for Connected and totally fell in love with it, 'Ballad of the Broken Seas', totally missed out on the second record but now I'm back in for number three 'Hawk'. It's a bittersweet record with Campbels husky Nancy Sinatra vocals paired perfectly with Lanegan's gravely midnight cowboy drawl. I also love the album cover (above), it's so sixties looking and really suits the music. Anyway, here's my fave song 'To Hell & Back Again'. Depressing lyrics made beautiful and hazy by Isobel Campbells gorgeous vocals. Enjoy.